UPDATED Jan. 10, 2019. If you have decided to keep Medicare Part B, you now need to decide what Medicare plan type is the best for you. 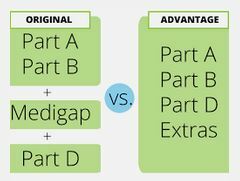 In other words, you need to compare the Pros and Cons of Medicare Advantage plans vs Original Medicare. Depending on where you live, you may choose one of the following types of Medicare plans. This is a crucial Medicare choice – like the decision whether to keep Part B; a wrong choice may be difficult to reverse. 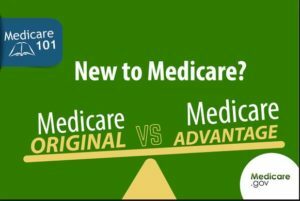 To help you analyze Pros and Cons of Medicare Advantage plans vs Original Medicare, consider the following advantages and disadvantages under each plan. Freedom to choose any doctor or hospital that accepts Medicare. There are no network constraints imposed by the provider (as is typical in an HMO) or by location. You are not required to obtain a referral. It is not subject to annual contracts that may be changed or discontinued. It may be complemented with a Medicare Part D plan. It may be complemented with a Medicare Supplement Plan (Medigap Plan) to protect against catastrophic out-of-pocket expenses incurred while on Part A and Part B of Original Medicare. Buying a Medigap policy limits your out-of-pocket costs. It works with other insurances and assistance programs. It does not provide additional benefits, such as dental and vision services. Without a Medicare Supplement (Medigap) policy, out-of-pocket expenses can be very high. A Medigap policy charges an additional monthly premium. The Medigap policy may also be difficult to purchase or quite costly if done outside the Medicare Supplement Open Enrollment Period or the Guaranteed Issue Rights Period. Medicare Advantage Plans must cover all of the services that Original Medicare covers. The plan can choose not to cover the costs of services that aren’t medically necessary under Medicare. Medicare Advantage premium is typically lower in comparison with total premiums spent on Medicare Supplement and Prescription Drug plans. The $0 premium plans are often available. Beneficiaries with preexisting conditions will not be denied enrollment or charged increased premiums. There are no health questions asked, and acceptance into Medicare Advantage is guaranteed (except the beneficiaries with ESRD). Plans may include extra services not covered by Original Medicare, such as dental and vision. Most of the plans include Prescription Drug Coverage in addition to Hospital and Medical benefits. You are always responsible for copayments and coinsurances, and sometimes even for deductibles. Therefore, the cost could be quite high. There is the out-of-pocket limit – $6,700/year. Your choice of doctors/hospitals is limited by the provider network within a specific geographic area. Members are required to pay an increased cost, sometimes up to the full price, for services outside the provider network. Medicare providers may not always accept Medicare Advantage plans so your choices may be limited. Some doctors and hospitals do not participate in any Medicare Advantage plans and others only in a selected few. Many plans require referrals for specialists and other services. Medicare Advantage plans may change every year. Such changes may affect your premium, deductibles, copayments/coinsurances, and the scope of extra services. Although Medicare Advantage plans are supposed to cover everything that Original Medicare covers, there is no obligation to include every benefit in the same way. The main appeal of a Medicare Advantage plan is that it is less expensive than a combination of Medicare Supplement and Prescription Drug plans. It also includes some extra benefits that are not part of Original Medicare. The disadvantages of a Medicare Advantage plan are that you are limited by the provider’s network; many plans pay less for some benefits (like skilled nursing care facilities), and yearly out-of-pocket expenses can go up to $6,700. Also, the services are inexpensive ONLY if they are within the plan’s network. Consider enrolling in a Medicare Advantage Plan as long as you are healthy and willing to stay within the plan’s network. Remember that as you increase your use of the services (which typically happens the older we become), your out-of-pocket expenses will start to exceed any premium savings. Otherwise, select the Original Medicare and complement it with a Medigap policy. In the case of serious illness, without Medigap stop-loss protection, you may incur very high medical bills. Our analysis of Pros and Cons of Medicare Advantage plans vs Original Medicare is very instrumental in the proper choice. Liberty Medicare is here to help you throughout the process of selecting and enrolling you in the best and most suitable Medicare Advantage or Medicare Supplement Plan. If you are looking for Medicare advice in deciding whether to select Original Medicare or Medicare Advantage, let us help you. To see quotes from Medicare providers fill out our Medicare Quote form. Alternatively, give us a call at 877-657-7477, and you will be connected to a licensed agent/broker.